So I wanted to get my eyes checked. Everything looked flat. As I was walking down the street optometrist’s office door just popped out at me. How could I resist? 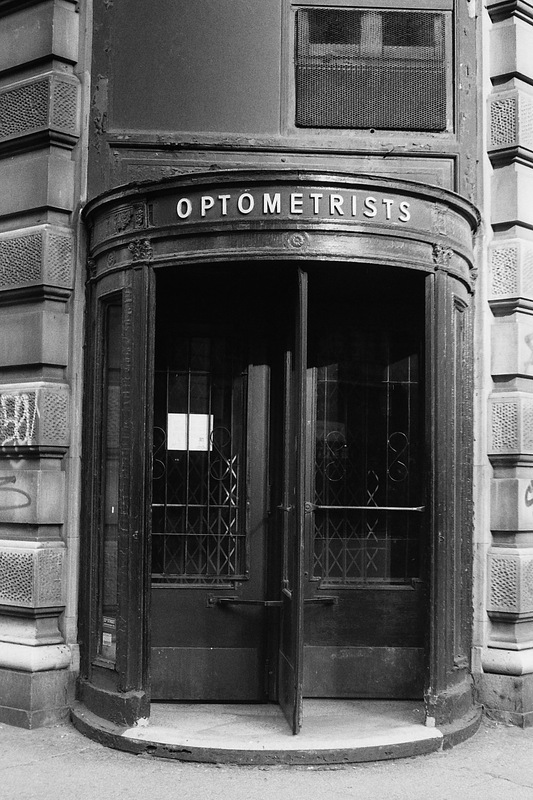 This entry was posted in Personal Stories and tagged 1990s New York, artistic process, doorway, eye doctor, optometrist, photography, revolving door, street photography, visual arts. Bookmark the permalink. I love this! Love the picture and I love that word. I have a board on Pintrest dedicated to just doors. I thought it was silly but I kept finding pictures of beautiful doors. Aberrations so to speak. Those pictures got so much attention and I was not alone in my love of doors. Doors are an excellent subject! I remember that I once tried to find this one door that the famous photographer Walker Evans photographed. I couldn’t find that one, but there were plenty of other photogenic doors around. Thanks, ambi-girl!